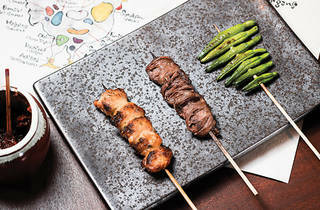 Toritama has been a rising star in Japan’s yakitori scene for quite a few years now. Tokyo’s ‘most authentic neighbourhood yakitori joint’ has won praise for serving up a quality array of rare grilled chicken parts to hungry diners. It’s always packed to the rafters and reservations are scarce. Not only that, when you do get in, there’s a strict two-hour seating policy. However, it’s now opened up a branch in Central, so we pop along to see whether this new eatery is fair or fowl – and whether it justifies the hype it has in Tokyo. On entering the venue, it’s chic and modern in its surrounds, with dimmed lights, dark woods and a semi-open kitchen, similar to the original in Tokyo, which is helmed by master grill chef Shiro Izawa. Here, Hironobu Matsumoto (who is a celebrity in Japan, having appeared on a TV programme called It’s Kitchen! where participants attempt to recreate famous dishes) is in charge of the food. 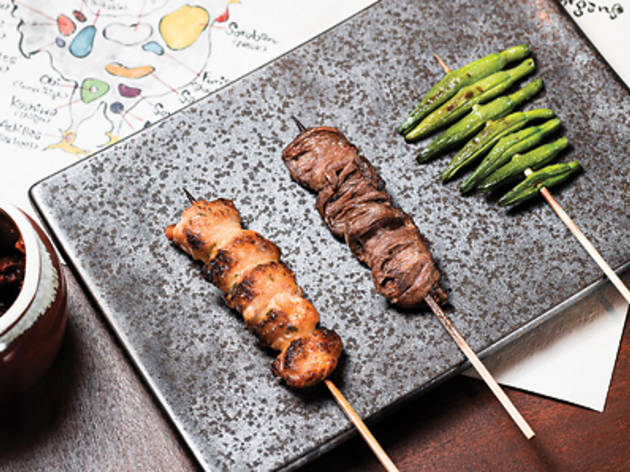 We just have to see how Matsumoto recreates Toritama’s iconic yakitori dishes in Hong Kong. Toritama is famous for its chicken, its special seasonings and its cooking methods, really homing in on a full-on beak-to-tail concept. Okay, Hongkongers might scoff at this as we’re no strangers to offal and tripe – but it’s rarely served as a high-end delicacy in our city. So it goes without saying that half the menu consists of offbeat chicken parts – but more adventurous items like intestines and grizzly chicken ovaries with the young eggs still hanging off them are not present here yet. That’s a little disappointing but there are plenty of other cuts to order, as well as sides and rice. We go for the seven ‘o-susume’ (chef recommended) course meal ($288), but you can go for 10 ($388) or 12 ($588) courses if you’re super hungry. Our journey begins with a marshmallowy soft meatball that’s mixed with ground-up soft bone. The cartilage grains add a bite to the meat, creating a rounded experience on the palate, while also piquing our interest for what’s to follow. And then the weird and wonderful cuts start coming, with the ‘root of chicken tail’ on a skewer arriving looking like that bit in a bird that you could accidentally sink a chopstick into – basically, the parson’s nose with a fatty layer of skin hanging off below – but, as we bite in with trepidation, we’re pleasantly surprised. It’s grilled perfectly crisp and juicy fats burst into the mouth with each bite. No pungency at all. A full flavour. We then dip into the refreshing quail’s egg and grated radish palate cleanser before we dig into the chicken heart, which has been tenderly grilled. We experiment with shichimi, ginger and matcha flavoured salts and find the grassiness of the green salt works best as the organ enhances the matcha tones. Then the much-coveted misaki hits the plate. This is a parson’s nose from a hen before it has laid any eggs, meaning it’s a superior cut of flesh, more tender and juicier than the norm, with an almost bouncy texture. Okay, the selection process is a little misogynistic but, hey, it makes for a deliciously rich treat. The next items up are a little duller: the ginko nut and the pork belly. They’re both tasty and well put together – especially the ginger wrapped in pork – however we’re hoping they’re eclipsed by the apiosu, a specially sourced vegetable from Japan that’s literally a cross between a potato and a bean. Sadly they’re not. Lightly grilled with a pinch of salt, the texture is too powdery so we lather it in some spicy sauce to give it some life. So that’s the seven courses – but we plump for a dessert, hoping for a fine finish to this journey. And, as soy sauce ice cream is the only choice on the menu, we see if this matches the heights of the other dishes (bar one…). It does. Superbly. It might sound an, erm, ‘challenging’ combination but think intense salted caramel with a hint of soy as an aftertaste. It’s a real taste extravaganza. Toritama should create a concept store built around this dessert and pair it with one of the sakes from the restaurant’s extensive collection (which includes rare vintages that are even hard to find in Japan). Toritama 2 Glenealy, Central, 2388 7717; toritama.hk.